This week, the Aliventures blog celebrates its second birthday. I’ve realised, though, that Aliventures has grown a lot … and you might not know that there are some new ways to keep up with things here. I’ve just revamped the Aliventures newsletter. It’s now a short, weekly dose of free writing advice and inspiration – along with regular free mini-ebooks, and exclusive samples of my new paid-for ebooks. 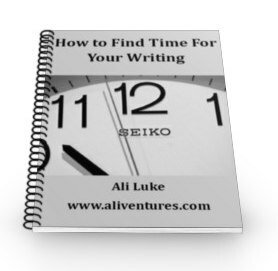 You’ll get a copy of my mini-ebook How to Find Time for Your Writing as soon as you’ve signed up. You can find out all about the newsletter, and join it, here. Since I started Aliventures, Twitter has grown hugely. There’s a great community of writers and bloggers there, so if you’re not already tweeting, now’s a great time to start. You can find me as @aliventures on Twitter. I’m on there most days, and I’m always happy to answer questions: just put “@aliventures” at the start of your question so that it gets to me. 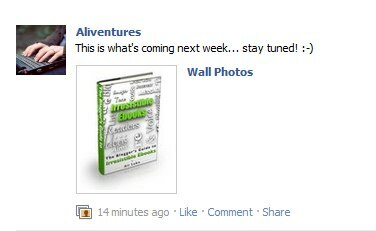 If you’re on Facebook, swing by the Aliventures page and hit “like” (or hey, just hit it in the box in the sidebar!) I link to all my new posts from my Facebook page, and I also talk about any news. You forgot the binoculars-through-the-window method of following you. I’m so glad I stumbled across you online. Are you including things in the newsletter that in the RSS feed? I’ll occasionally link to a post here on Aliventures, but the newsletter content is otherwise entirely new stuff. Ali, I noticed you haven’t yet gotten on Google+. I know it’s yet another social network to keep up with, but I’ve been making good connections with quality people there while spending a bit less time on Twitter and Facebook. I haven’t yet — I’m waiting to see whether it goes the way of Google wave… 😉 I don’t want to hesitate too long, but I also don’t want to jump on every social media bandwagon that goes past! Congrats on the 2 year blogiversary!!! Sonia G Medeiros’s last blog post ..Why Hop on the Merry-Go-ROWnd? Happy Birthday to you, Happy birthday to you, Happy Birthday to Ali’s blog, happy birthday to you. It seems just like yesterday that I happened to come across your writing and, later, your blog/newsletter. Here’s wishing that you are able to live your dreams. You are the rock star of the blogosphere. Hail!